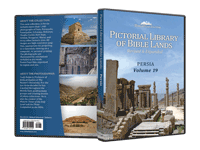 The ancient city of Pasargadae lies 25 miles (40 km) to the northeast of Persepolis, in the Fars Province. 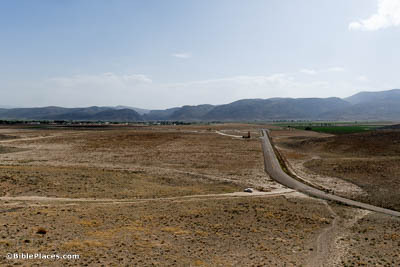 Though the barren plain it sits in may look unimpressive now, it was here that Cyrus the Great chose to build his capital. Even after the seat of Persian power moved to Persepolis, later kings still traveled here for their coronation ceremonies. 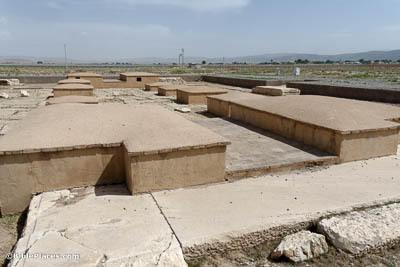 Cyrus’s large palace complex consisted mainly of impressive rectangular halls. 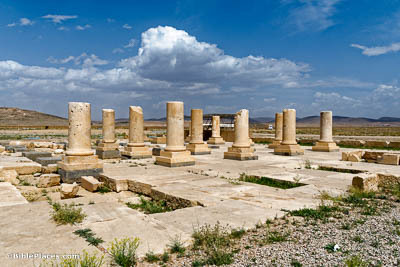 Though some of the buildings were used for public events, these columns belong to a structure that may have been Cyrus’s personal residence. Regardless of its purpose, it seems that the building may have seen ongoing construction through the time of Darius I. It may not look like much now, with only the foundation still intact, but this entrance to the palace complex may very well have made architectural history in its day. 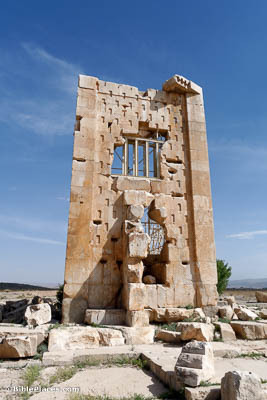 This gate was built as a freestanding monument—possibly the first freestanding gate monument in ancient Persia. Other monuments like these would later appear in the architecture of Persepolis. 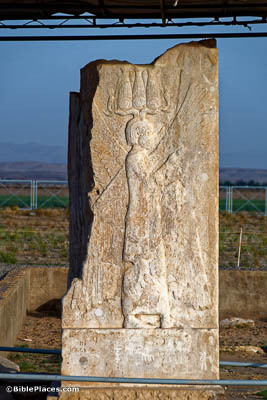 One of the reliefs found at Pasargadae features a winged figure wearing a crown. Though it seems to depict some sort of cherub-like character, some have concluded that the figure represents Cyrus. Consequently, a drawing based off of this relief is now often used to depict the Persian king. This structure is one of the most striking found at Pasargadae, but its purpose remains something of a mystery. Some identify it as a fire temple, while others think it may have been used for coronation ceremonies. It has also been suggested that this may be the tomb of Cambyses, son of Cyrus. In any case, its modern name (which means “prison of Solomon”) is certainly erroneous. By the time of his death in 530 BC, Cyrus ruled much of the known world. According to Herodotus, he died in battle at the northeastern edge of Iran. 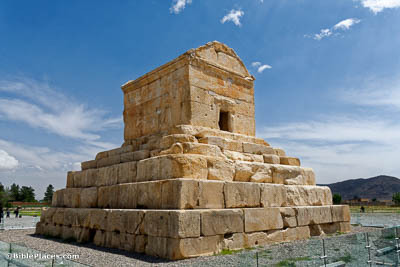 His body was buried in Pasargadae, and this monument was built over the spot—a strikingly humble burial, especially when compared to later Persian rulers.